The blog for PRSA's Counselors Academy and a forum for CA members to share ideas, discuss best practices, comment about the public relations industry and learn from each other. Enjoy! This blog is subject to the terms of the PRSA Blog Policy. Click the link above for more information. Purpose and passion are necessary qualities in leaders. Without the ability to effectively communicate visions with employees, inspiration and motivation will be hard to find. Bates explains that leaders need to design their message with their employees in mind, which leads employees to share the same passion that drives the CEO. “People remember stories, not business plans” says Bates. She explains that public relations professionals often have a hard time telling their own stories, but by refining the “big idea” into powerful stories teams learn to understand how to execute the strategies necessary to succeed. “Leadership is all about teaching through storytelling” says Bates. Bates also emphasizes the importance of keeping in touch with your employees’ thoughts and feelings, monitoring your own feelings and constantly seeking out fresh ideas to avoid the slump in morale that so easily occurs after the initial excitement of new campaign plans. For a geek, Robert Stephens is surprisingly personable. As founder and “chief inspector,” as he likes to refer to himself, Stephens is responsible for positioning The Geek Squad as the nation’s largest technology support company. Stephens’ lecture, Geeks Unite: How Geek Squad Used Reputation to Build a Strong Brand, was insightful, relevant and unexpectedly humorous. While delving into his past he shared some of his most significant public relations and business management tactics. His most noteworthy points included creating an interesting brand, the importance of practicing transparency and authenticity, tips for managing new businesses and the value of visualizing your competition. “Above all else, a company must have a great logo.” Stephens emphasized iconic corporate brands, such as Apple, with timeless graphic designs inspired by simplicity. He advised attendees to envision a company’s brand as a movie title; he believes a brand should project heart, soul and social relevance. Authenticity and transparency start with employees. It is important to inspire and influence from the top so employees understand and project the story behind the brand. “Authenticity can’t be faked. PR has to be earned,” says Stephens. Three techniques that facilitated Stephens’ success as an entrepreneur: take care of your employees, don’t take yourself too seriously and make decisions that are true to your brand. Envision and attempt to create your business’s arch enemy to proactively address your shortcomings and promote innovation. You will always benefit from knowing your competition. Loss of Focus: McKee found that the old saying “Jack of all trades, master of none,” caused many problems within the company. He realized that if they re-focused their business’s specialties they would be more successful. Loss of Nerve: As seen with Starbuck’s reaction to McDonalds $100 million dollar café campaign, it is never a good idea to steer away from what you stand for as a company. “If you decide to not react to issues at hand, whether it be competition or loss of a hold on your industry, your business will stop. Don’t become numb to your problems,” said McKee. Lack of Consistency: Public relations, advertising, Web site; it all must be consistent. McKee saw that the company had inconsistent ideas of who they were. “Today we have an amazing public relations team that keeps our messages consistent. Without consistency people will never know who you are or what you stand for,” said McKee. Some of you have asked for us to aggregate the various blogs some of our Counselors Academy members write. We're experimenting with that concept now and will see how it goes over the next week or so. If you'd like your blog's feed or another feed considered for inclusion, use the comment button below and let us know. Thanks in advance while we work the kinks out! There's an interesting debate raging in the current issue of The Strategist (far and away, the best PR trade publication in this blogger's opinion). The subject is millennials and the debate is whether they are slackers or simply an updated version of the average, hard-working American of the past. Ed Cafasso, a Manning, Selvage & Lee executive, posited the former view, describing them with such well-worn criticisms as 'self-centered,' 'possessing poor writing skills' and 'having a definite sense of entitlement.' He tarnished millennials as doing little more then holding out their hands in expectation of immediate gratification. Bob Kornecki, who teaches PR at Loyola University Chicago and Northern Illinois, disagreed, blaming indulgent, Baby Boomer parents for any millennial self indulgence, espousing millenials' work-life balance demands as being smart and healthy, and proclaiming them to be more techy-savvy, informed and realistic than their predecessors. Stop. You're both right. I've met all types of millennials, both in the workplace and on the college lecture circuit. Some can't write. Others do expect the world handed to them on a silver platter (one job seeker, for example, asked me to research which public relations firms she should contact for employment). And, there are more than a few millennials who have no idea of any world history prior to 1990. On the other hand, there are millennials like Sarah Gatling and Alexa Richards. Both are College of Charleston students. Both volunteered to staff the recent PRSA Counselors Academy Conference. And, both took the time to 'report' on the proceedings on the Counselors' blog. These two millennials also mailed handwritten notes to me, thanking me for the opportunity to experience the Academy conference and sharing some of their learnings from the event. Alexa and Sarah are the types of millennials who dispel the conventional wisdom about their generation. They're also the types of millennials who will one day be leading PR firms and departments. Bottom line: like every generation that preceded them, all millennials are not created equal. One of the sessions at this year's Spring Conference was a new one, Book Club. The concept was a simple one: four presenters were to choose a business book and discuss it for the participants. Then the whole group would discuss recent reads and share some of the ideas learned through the process. The session was spearheaded by Elise Mitchell of Mitchell Communications Group, with the panel comprised of Lisa Simon of Simon Public Relations Group, Monty Hagler of RLF, Roy Reid of Consensus Communications and myself of The Cohesion Group. Partners in Command focused on the relationship between and the leadership qualities of George Marshall and Dwight D. Eisenhower during World War II, outlining how they made an extraordinarily effective team during the war and in their efforts to bring peace and stability to the world. Meatball Sundae defines 14 trends no marketer can afford to ignore. It addresses what to do about the increasing power of stories, not just facts; discusses shorter attention spans and how to work within that new framework; and explains the new math that says that five thousand people who want to hear your message are more valuable than five million who don't. Full Frontal PR is a practical primer (and a refresher) on media relations. It's a tactical "how to" on placing stories in traditional print and broadcast outlets with some surface treatment of new media. The Four Obsessions of an Extraordinary Executive provides a model for effective team leadership though a fictitious account of how the process works. The opening line, "if everything is important then nothing is," captures the foundation of the author's premise that leaders must have a system to help their teams effectively deal with the most important issues, including defining them. All of these titles are available at your favorite bookstore or online book retailer. If you have a recommendation for a book, article, publication or blog you think other Counselors Academy members would find interesting, please add a comment to this post. No one mentioned whether or not you'd receive a gold star for choosing a selection from this list this summer. Surely it was an oversight. Six students. Three days. One unbelievable opportunity. 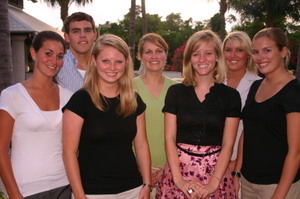 In late February 2008, the College of Charleston Department of Communication Advisory Board, of which Steve Cody is a member, offered students the chance to be the first student volunteers to participate in the Counselors Academy Spring Conference. After the application and interview process, myself and five other students were chosen to be the representatives. On May 17, we piled into a van destined for Naples, excited to meet people who we thought embodied the essence of PR. On first arrival, after our technical briefing with Jason Anthoine and Abbie Fink, we walked into Sunday night's reception not knowing what to expect. We were grateful for the welcome we received, and left knowing we would work as hard as we could to make our school and the members of the Counselors Academy proud. Throughout the conference, along with reporting on the various sessions and keynote speakers, we gained invaluable insight into the profession. Tom Amberg opened our millennial eyes to the reverse mentoring relationships we will encounter in our careers. In honor of Lynn Casey, we all plan to carry on the spirit of continuous learning so that the world and profession we work in continues to grow. Our hard work and learning matched the fun we had. Darryl Salerno's breakout session, English as a First Language, will always cause us to question our spelling and pronunciation. After a great learning experience interviewing our respective SAGE member at lunch, we will continue to debate whether we had key lime pie or cheesecake for dessert. And to Steve Knipstein: the challenge to the best waterslide ride still stands. Jason Anthoine, head honcho of The Cohesion Group, has left his mark on the PR industry, and apparently the fashion industry as well. 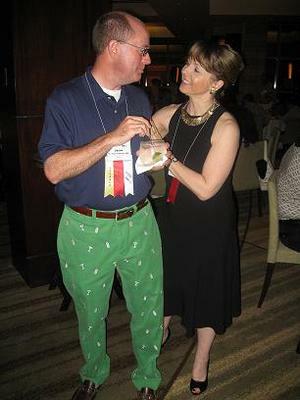 On Sunday night, Anthoine, shown here with Deb Radman, immediately attracted the attention of his esteemed, and well-dressed, fellow Counselors as he proudly paraded into the Starlight Reception, clad in green pants covered in a martini glass and shaker design. Heads turned in awe, and then turned back with looks of sympathy as his brave wife, Jana, followed a few generous steps behind. While the food and conversation was great, nothing quite compared to the striking outfit worn by the confident Georgia communicator. The bar has now been set high, as Counselors will look to dress in a way that merits the worthiness to share a room, and perhaps a drink, with the fashionable Jason Anthoine in conferences to come. In all seriousness, Jason served as one of the student’s greatest allies and friends throughout the Counselors Academy experience. I believe I speak for everyone from the College of Charleston team when I say, “We couldn’t have done it without you.” So, thank you, Mr. Anthoine. When putting three of the top minds in marketing together, even the most seasoned of audience members are in for a valuable learning experience. Bruce Himelstein, Senior Vice President of Sales and Marketing, The Ritz-Carlton Hotel Company, provided insight into the necessity to integrate marketing and PR. Underscoring that “every step we make has to be done in sync,” Himelstein feels that PR has become more important than advertising for his company. Mark McCleary, Vice President of Marketing, Life Fitness, discussed making his brand stand out in a global market. Speaking from success, McCleary gave advice on how to strengthen a brand’s image. His presentation emphasized global agency coordination as vital, an outsiders point of view as invaluable and research as a necessity. McCleary summed up his speech by asserting that value comes from constantly offering new ideas in the marketplace. In today’s evolving and highly competitive market, these speakers suggested that the seamless integration of marketing and public relations will be imperative to success, meaning that PR no longer has to look up to its brothers and sisters in marketing, but instead has a seat at the table. As Counselors arrived in Naples, they were greeted by smiling friends they’ve met at conferences past. However, amidst the sea of familiar faces drifted a number of new members to the Counselors Academy. These members joined a group of the most elite and thought members of the PR industry to experience a sharing of knowledge and opportunity unlike any other. In speaking with new comers to the conference, one recurring theme was the appreciation for the new relationships that were built. Chuck Norman, S&A Cherokee, Raleigh-Durham, NC, agrees with this sentiment . For these new members, the experience has been priceless, and they now look forward to flying out to Palm Springs next year.